View upcoming performance dates & times in our Season at a Glance calendar. Find out how to order tickets online through Vendini. One of the Freshman Plays underway in Dickinson's black-box theatre, The Cubiculo, located in downtown Carlisle above the historic Carlisle Theatre. 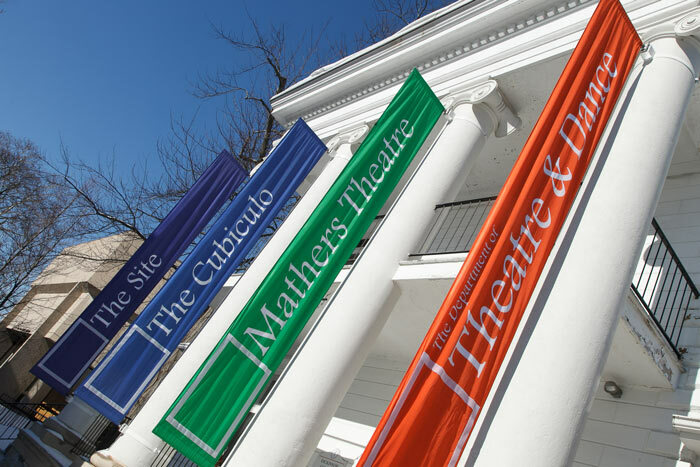 Mathers Theatre, host to theatre and dance productions and special performances by guest artists, is a 225-proscenium-seat venue that offers spacious stage flooring, LED theatrical lighting, modern sound equipment and easy access from the Holland Union Building. Montgomery House is centrally located on Dickinson’s campus directly behind the Holland Union Building and the Waidner-Spahr Library. It houses several design labs, the Costume Studio (above) and faculty offices. The Site dance studio hosts dance classes and serves as rehearsal space for students in the dance program. Special sprung flooring, a wall of mirrors and smart technology for teaching add to the already creative space.